The theme of the first MasteryCon is “Moving to Mastery” and will feature presentations from teachers and administrators implementing MasteryConnect in the classroom and doing the hard work of tracking mastery. Educators like Patrick Coleman, Instructional Coach for Ohio’s Euclid School District; Danielle Sellenriek, Curriculum Director for Missouri’s Willard Public Schools; Garrick Peterson, a former middle school principal from Orem, Utah; and Angeline O’Neal, an 8th grade teacher from Francis Howell in St. Charles, Missouri. Find out how you could win a trip down an Olympic Bobsled track. Pitch your own session and become a presenter. Plan your trip and get registered today! Check out all the details on the MasteryCon 2014 page. Students just learn better when teachers use short-cycle formative assessments to guide student learning. That’s what we believe and that’s what the data shows. A district piloting MasteryConnect recently shared this research with the MasteryConnect team, so we wanted to share it with you! Teachers need smaller class sizes and constant learning, don’t get us wrong. 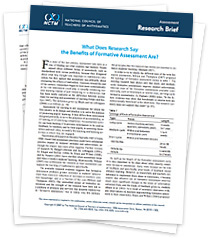 But this study underscores the critical role of formative assessment work in the classroom! In the study, student learning was doubled when compared to classes where formative assessments were not administered. If you have a story to share about the impact of short cycle formative assessment at your school or district, we’d love to hear it!